What did you do to your 6.7 this week? I will start I changed both fuel filters, did an oil change, and removed the front air dam. I dont like the look of the bumper without it, and have read the 2wd air dam is shorter and looks good. So I ordered one from Westland ford for $90 and picked up 1 backup sensor too. [CENTER] 2013 Lariat Eco-Boost F150 Super Crew 4x4 20K Miles. Max-Tow 3.73's, luxury package. Amp Steps, Raceline Raptor Wheels, Bak-Flip, and much more. Last edited by BIG Laing; 10-26-2012 at 06:03 PM. Did the SEIC high idle mod, installed backup flood/spot lights and a cargo light in the box. It was a productive afternoon. I bought a 12" LED light bar. But when I took it out of the box and held it up to my replacement I decided I needed a bigger one. So I'm sending it back and getting a 32". I'll post pics after I get the bigger/better bar installed lol. 18" Rockstar Wheels, Nitto Tires, Bushwacker Fender Flairs, CB and Antenna, cell phone booster and Antenna, WeatherGuard Tool box, Rear Wheel Well Liners and Mud Flaps. john galt and dimitrios713 like this. Your Freedom To Be You Includes My Freedom To Be Free From You!!! Pictures? And I havn't seen wheel well liners before, where did u get em? I drove my dads new 6.7 for the first time ill tell you what that camera makes it a breeze to back into trailers! I love it! 1995 f250 standard cab long bed. 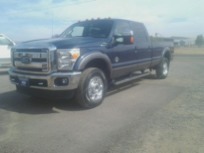 ts 6 pos chip, 4 inch exhaust, 6637 intake, gauges, zf5 manual single mass flywheel, lots more to come! broncobilly_69, JpfF350 and Kevinsherrill20 like this.